So we’ve lived in the house for 2+ years, and I’ve eagerly been planting all sorts of vegetables, from garlic to potatoes to artichokes. 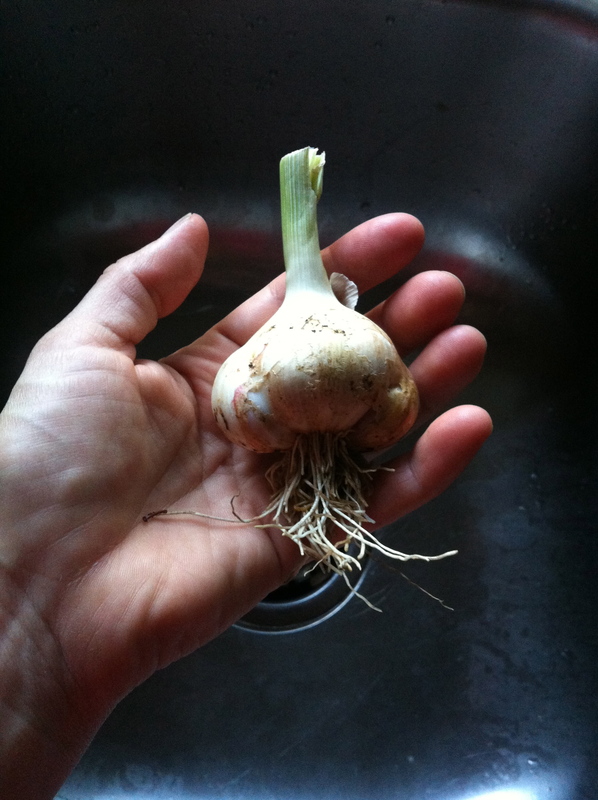 Garlic is a crop that is supposed to be super easy to deal with. Basically, you plant the cloves in the fall (early November for me in Portland) in good soil, and pull ’em up in the summer (early July). 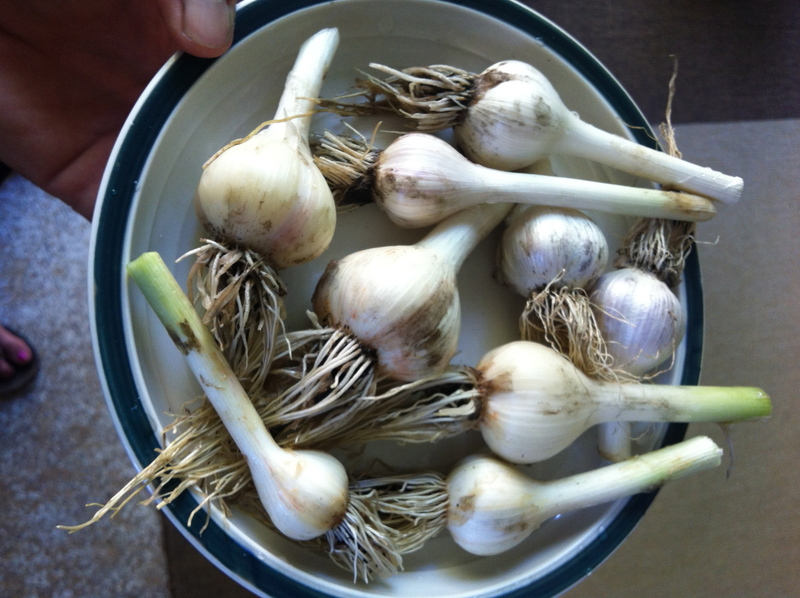 Im 2012 I ordered my seed garlic from Seeds from Italy, and had great success in 2013. In 2013, I ordered my garlic from different sources. I got some Music and Spanish Rioja garlic from Territorial Seed, and some Nootka Rose (native) garlic from a local homestead place. 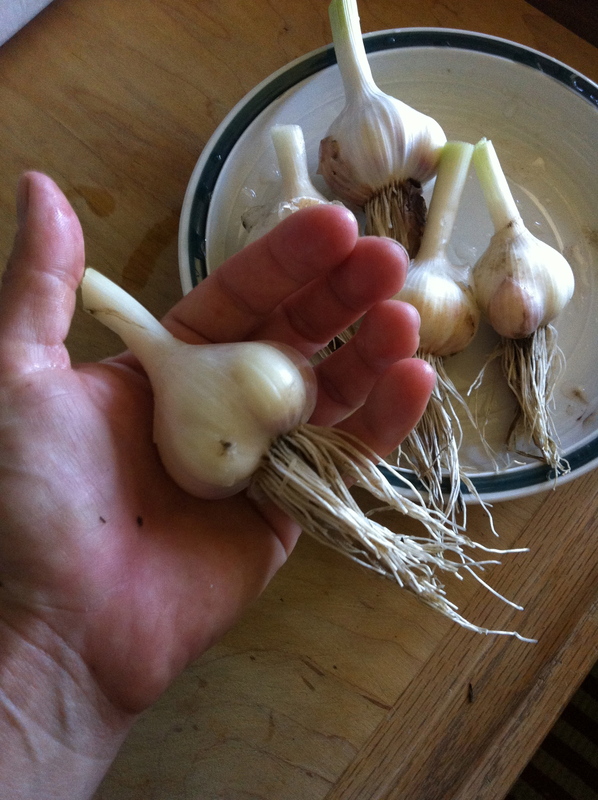 I was a little put off by how non-US garlic has to be sprayed before coming into the country when ordering from Seeds from Italy. Unfortunately, my 2014 crop is much less successful than 2013. First of all, I GOT RUST. I wasn’t sure what to do, since I don’t want to use “cides” and it was too late anyway. Since a rust problem, if it sets, can eff up your beds for up to 2-3 years, and I planted my 2013 garlic EVERYWHERE bc I had too much, I decided to take some preventative measures. I knew that the rust wouldn’t affect the bulbs. Meaning, I wouldn’t be eating rust when I pull the bulbs. So I focused on preventing the rust from setting into the soil. What that means is, once the rust-colored spots turn black, the fungal spores are ready to fall off and land in your soil (and then it’s all over!). 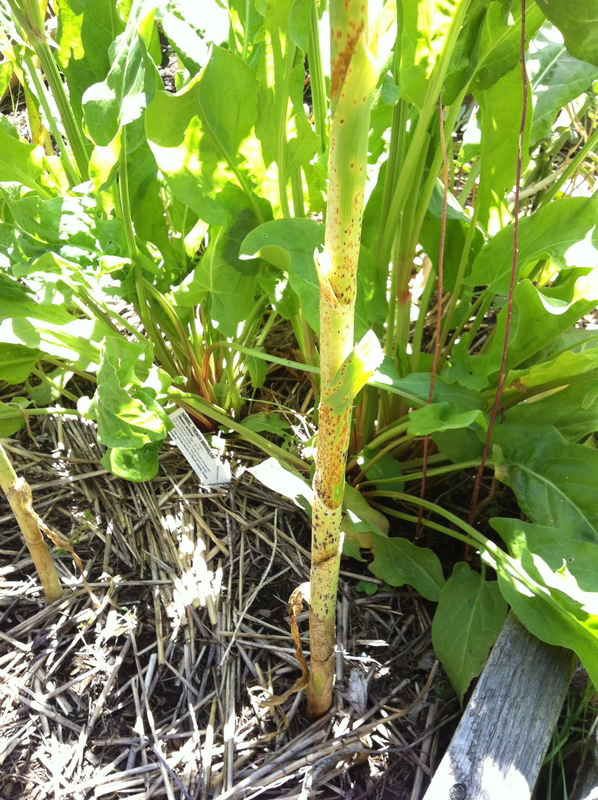 I started in the spring by pruning off infected leaves, sometimes leaving some leaves, other times leaving stumps. During all of this, I crossed my fingers. It’s all wishful thinking, really. No matter what I’ll still skip a year just in case. Wah. Then I removed the outer layer of skin on the stumps, which got rid of the spores. I did all of this in May. It’s now July – Today I pulled up some of all of them to see if my methods worked. Here are the results! 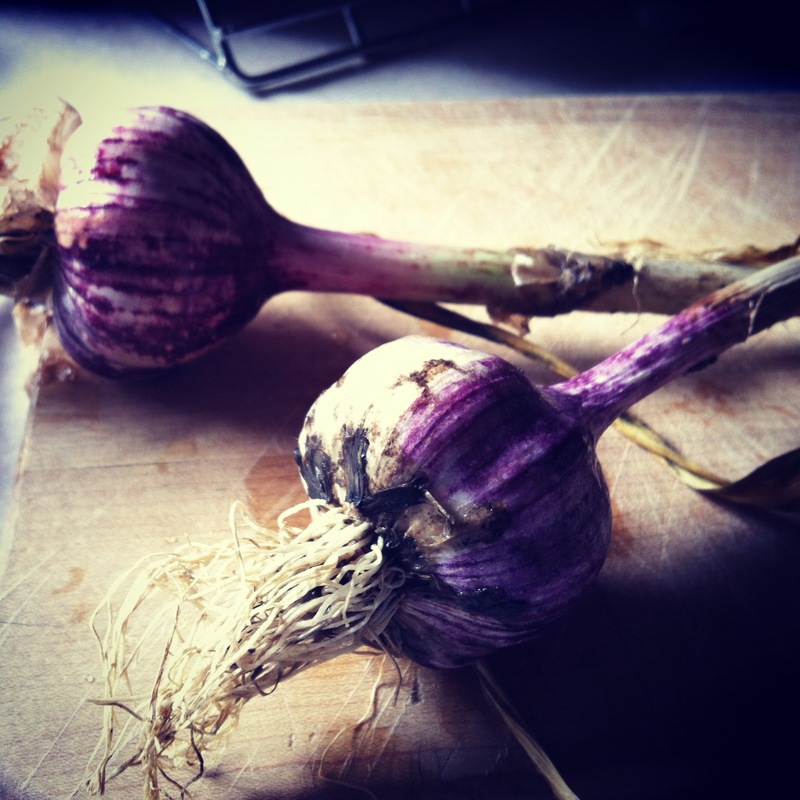 Overall, I think I’m most impressed with the Spanish Rioja garlic variety. But I haven’t pulled all of the Music yet. Stay tuned. Next Post Potato cage harvest day. Results? Meh.